Last Candidate MC Mark Busse with debate finalists Pete Fry (Green) and Andrea Reimer. (Vision). 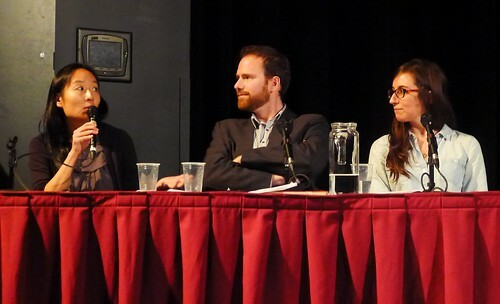 On Sunday, November 3, 2014, the Vancouver Public Space Network held the third edition of Last Candidate Standing, an election debate unlike any other in the current municipal campaign. As with previous editions (in 2008 and 2011), the 2014 version saw lively exchanges, enthralling repartee, and more than a little old-fashioned political theatre. It also featured over two dozen candidates. 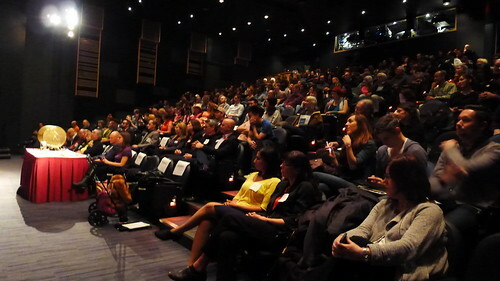 The event was supported by SFU’s Vancity Office of Community Engagement, and a crack team of event staff and technicians. Additional sponsorship support from the newly minted Urbanarium Society. 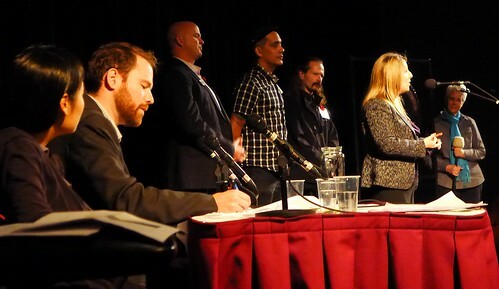 Each and every of the 49 candidates running for Mayor and Council were invited to participate in the debate. Of these, 31 candidates indicated they would attend, and a grand total of 27 showed up on event day. 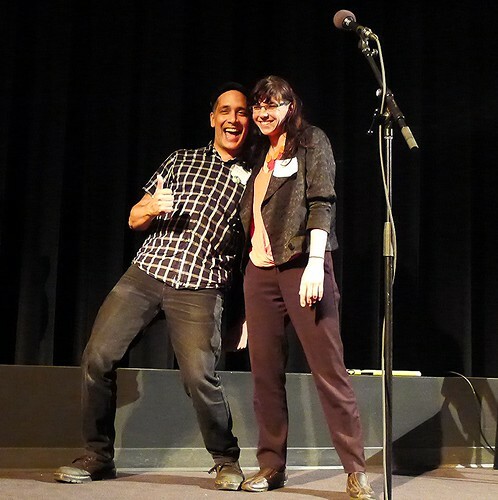 After nearly three hours of debate, the 2014 Last Candidate winner was declared: Andrea Reimer (Vision Vancouver). The runner up was Pete Fry (Green Party). The event saw a total of five rounds of debate. 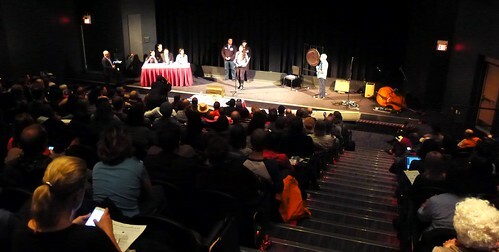 Candidate names were randomly drawn in sets of three or four from a bingo drum, and each candidate was given at least one chance to answer a question from the Panel of Inquisition (Megaphone’s Jackie Wong, CTV’s Jon Woodward, and Metro’s Emily Jackson). Each set saw the top answers earn a pass to the next round, creating a successively smaller pool of debaters as the day unfolded. The event was MC’d by Mark Busse, and featured musical support by houseband, The New Shackletons. Professional gong player Kathy Cameron (Soul of Sound) helped to let candidates know when they had run overtime. The following provides a breakdown of the different rounds and sets. Video from each of the rounds will be available shortly. Set 1.1 – Melissa DeGenova (NPA), Colin Shandler (Ind. ), and Rick Orser (IDEA). [DeGenova and Orser move to Round 2]. Set 1.2 – Anthony Guitar (Ind. ), Cherryse Kaiser (Ind. ), and Jeremy Gustafson (Cedar). [Guitar and Kaiser move to Round 2]. Set 1.3 – Meynard Aubichon (STOP), Ludvik Skalicky (Ind. ), Glen Chernen (Cedar). [Aubichon and Skalicky move to Round 2]. Set 1.4 – Adriane Carr (Green), Niki Sharma (Vision), Gayle Gavin (COPE). [Carr and Gavin move to Round 2]. Set. 1.5 – David Angus (Ind. ), Nicholas Chernen (Cedar) and RJ Aquino (OneCity). [Aquino and Chernen move to Round 2]. Set 1.6 – Jesse Johl (Vancouver 1st), Andrea Reimer (Vision), Audrey “sχɬemtəna:t” Siegl (COPE). [Johl and Reimer move to Round 2]. Set 1.7 – Bob Kasting (Ind. ), Mike Hansen (Ind. ), and George Affleck (NPA). [Hansen and Affleck move to Round 2]. Set 1.8 – Mark Boyer (Ind. ), Rob McDowell (NPA), and Sid Chow Tan (COPE). [McDowell and Chan move to Round 2]. Set 1.9 – Pete Fry (Green), Suzanne Scott (NPA), and Keith Higgins (COPE). [Fry and Higgins move to Round 2]. Set 2.1 - Ludvik Skalicky (Ind. 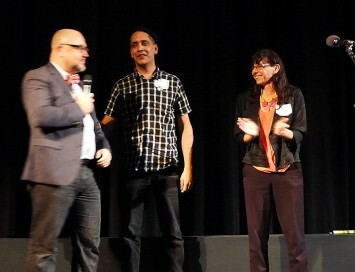 ), RJ Aquino (OneCity), Andrea Reimer (Vision). [Aquino and Reimer move to Round 3]. Set 2.2 – Melissa DeGenova (NPA), Rick Orser (IDEA), Rob McDowell (NPA). [DeGenova and McDowell move to Round 3]. Set 2.3 – Anthony Guitar (Ind. ), Cherryse Kaiser (Ind. ), Keith Higgins (COPE). [Guitar and Higgins move to Round 3]. Set 2.4 – Adriane Carr (Green), Jesse Johl (Vancouver 1st), Nicholas Chernen (Cedar). [Johl and Chernen move to Round 3]. Set 2.5 – Mike Hansen (Ind. ), Sid Chow Tan (COPE), Meynard Aubichon (STOP). Set 2.6 - Gayle Gavin (COPE), George Affleck (NPA) and Pete Fry (Green). [Gavin and Fry move to Round 3]. [McDowell and Fry move to Round 4]. Set 3.3 – Jesse Johl (Vancouver 1st), Nicholas Chernen (Cedar), Sid Chow Tan (COPE), Keith Higgins (COPE). [Johl and Chernen move to Round 4].